War brings many of most stark and tragic images of history. Here, after taking a torpedo in WWII, the USS New Orleans is anchored at Tulagi Island in the Solomons Islands. The ship has been camouflaged to protect from another attack. Carrier battles make for interesting campaigns as they were carried out by limited forces (those aboard ship) at a set of limited targets (an island or an opposing task force), little hindered and aided by units outside the scope of the campaign - especially across the trackless expanses of the Pacific. More importantly, these battles changed the way nations designed their navies. The largest naval battles of World War 2 were fought with the opposing fleets never sighting on another. The carrier developed from what was seen as a supporting unit by naval theorists in the 1920s and 1930s (portable air-cover against annoying enemy scouts) to the main striking arm of a bluewater navy. The battleship, in development for more than three centuries to stand in a battleline, the centerpiece for nearly very navy in the world, was eclipsed as the definitive unit of naval weaponry. Aircraft could outrange its guns rather handily, and dive bombs and torpedoes could be more decisive than cannon-fire. Great pictures....in fact last time when I visited UK I had taken ferries to france and during my ferry travel had taken excellent photoes which I will be uploading soon..! 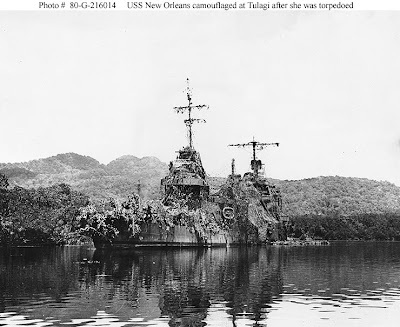 somewhere I did read that USS New Orleans was seen after the Battle of Tassafaronga near Tulagi on December 1, 1942.